Artist, high school teacher and "hard-liner" (yet to be defined). Republicans ended up with 33 more seats?" I feel like with all the discussion about this "come to Jesus" moment the Democratic Party supposedly needs (and I'm not saying there shouldn't be discussions of policy and changes...) people are still not very well informed about just HOW MESSED UP our districts are. We've lost seats, but not simply because people are not voting for Democrats. CA adopted a fair districting system years ago, and the result? The GOP is only 30% of the vote, and the elections reflect the actual electorate. It's a Democratic majority state, to the point where we can be picky about which left candidate we'd rather have. We passed a millionaires tax, for god's sake. Twice. Eric Holder started an org to work for fairer redistricting. Sign up today! "Republican gerrymandered districts after the 2010 Census have put Democrats at a massive structural disadvantage. That’s why the most important turning point for the future of the Democratic Party will take place in 2021: when states redraw their Congressional and state legislative lines. The National Democratic Redistricting Committee (NDRC) is an organization of Democratic leaders enacting a comprehensive, multi-cycle Democratic Party redistricting strategy over the next 5 years and beyond." Sen. Bernie Sanders (I., Vt.) and Rep. Keith Ellison (D., Minn.) faced criticism on Thursday from the liberal-leaning blog Daily Kos and the National Abortion and Reproductive Rights Action League for their scheduled event embracing Heath Mello, a pro-life Democrat running for mayor in Omaha, Nebraska. Sen. Bernie Sanders (I-VT), who campaigned on a progressive platform during his 2016 quest for the Democratic presidential nomination, will speak at a rally Thursday that will include anti-choice Democrat Heath Mello. Sanders and Mello, along with Democratic National Committee Vice Chair Rep. Keith Ellison (D-MN), are scheduled speakers at the “Come Together, Fight Back, Vote Democrats” Rally in Omaha, Nebraska, where Mello is running for mayor. The event is a part of a party-sponsored national tour. Sanders voiced his support for Mello in a statement published Wednesday by the Wall Street Journal. “If this fellow wins in Nebraska, that would be a shot across the board, that in a state like Nebraska a progressive Democrat can win, that will give hope to folks in other conservative states that perhaps they can win as well,” he said. On Wednesday's Morning Joe, Vermont Sen. Bernie Sanders went on to talk about working with Donald Trump and the future of the Democratic Party. Host Joe Scarborough brought up the question of abortion and other "social issues" that he said kept white working-class voters voting Republican in states like West Virginia, where they would gain more economic benefits if Democrats were in charge. He suggested that if Democrats want to win white working-class voters in states like Kentucky, they might need to run candidates who reflect the social values of those same white working-class voters — that is, opposing a woman's legal right to decide for herself whether to carry a pregnancy to term. Could Democrats, Scarborough asked Sanders, "be open to candidates that may not be rigidly pro-choice, may not be rigidly pro-gun control?" Sanders said yes. I wanted to post a little something personal--I almost posted it in Postmortem, but I wanted a more intimate setting. It isn't really socialist related, but I hope subscribers here will indulge me. My stepson recently started taking an interest in politics. He very seriously told me and his father that now he's settled into a job, and adulting, he felt it was time to turn to the other adult pursuit of his civic duty. We helped get him registered to vote at his new rental address, and naturally talked a lot about the election. He's the son of an immigrant mom, and his dad's side is also from another country on the paternal side, so my stepson had a natural aversion to Trump. I think he probably was intrigued with Bernie, but was ABT by the time the general rolled around. At the last minute he had a chance to visit in South Korea for a month with his girlfriend (who is from Korea,) and he remembered a day or two before he left that he would miss his chance to vote if he didn't fix a way to get his ballot in from another country. I'd never dealt with this either, and later we realized there were easier ways to get his mail-in ballot to him in Korea--but eventually he managed to get some kind of federal provisional write-in ballot while in Korea. If you know anything about the CA ballot for the 2016 election, it was four pages long, with about 20 measures to vote on, in addition to all of the candidates. He had to write in everything...all of the measures and all of the candidates. By hand. But he did it. The embassy where he could drop it off was closed the last day he was going to be around Seoul near the date of the election, so he spent $20 mailing it internationally to get it to the USA in time for the deadline. The day of the election dawned, and he and his girlfriend were, ironically, visiting the DMZ. They spent a pensive and existential day looking across into North Korea, at the sort-of Potemkin village the DPRK has set up for tourists to see from telescopes across the border. They were leaving when all of a sudden his girlfriend's cell phone started blowing up with texts from her sister in CA--with the results of the election here. They got the news that Trump was the President-elect from the side of the road in South Korea. They came back and told us this story. Even though the election went poorly and we were so saddened by the results, I was proud of him for going to such lengths to make sure his vote was counted. It made me cry. There have been a lot of posts about youth cynicism with the process of democracy, so I thought I would share the one story that has kept a little fire burning for me this year. Famed activist and academic Angela Davis on Friday urged voters to “do whatever is necessary” to avoid a Donald Trump presidency, Fusion reports. Davis, who is Distinguished Professor Emerita of History of Consciousness at U.C. Santa Cruz, was speaking at the Brooklyn Museum in New York on Friday, where she was recognized for her commitment to advocacy. Davis cautioned against allowing GOP candidate Donald Trump to take the election in November. “We talked about the emergence of new movements, but what we haven’t referred to is the extent to which racism has been revealed and in ways that many of us, who are seasoned activists, had thought to be consigned to dustbin of history,” Davis told a rapt audience. They identify voters who are known to be Sanders supporters or likely to be Sanders supporters by demographic information, new voter status, or whatever. Those are the ones who are most likely to be purged or given incorrect information. Please tell me who was not sent the generic instructions that we all get in the mail, based on demographics. 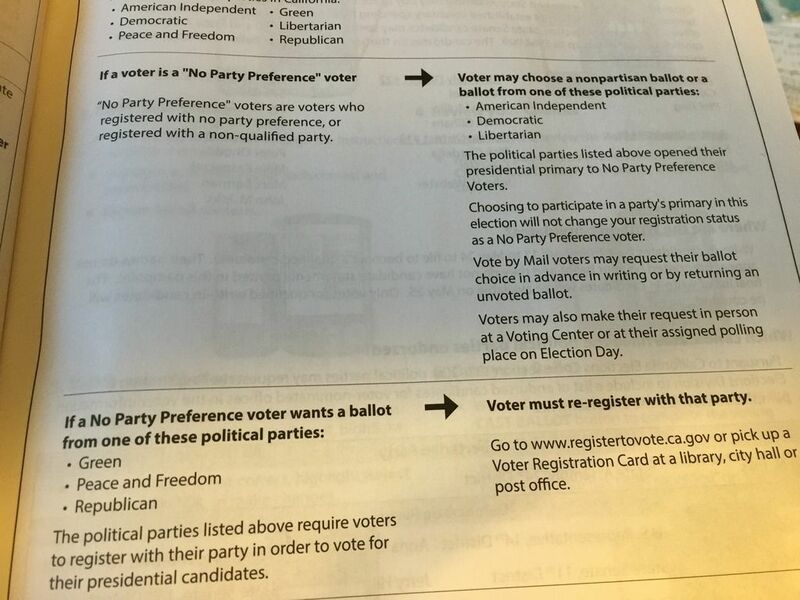 I will donate $100 to Bernie if you can prove that NPP registrations were not sent a copy of the booklet all registered voters get in teh mail, which is the image I posted in my post above. I changed my registration from Green in Oct. to Dem so I could get a Democratic Primary ballot for President. By that measure, I should have been "purged" a la your theory, by demographic. But I got the ballot I needed and voted for a Dem Presidential primary candidate. So please, proceed. That has nothing to do with CA. Your list was applied to mainly CA NPP registered voters. The instructions for CA NPP voters to vote in the Democratic primary are more than clear, and are sent out in the instructions that are sent out to everyone who is registered in any way. There are no mailings from the SOS that are sent to anyone based on party. Voters can check their registration online, at any time. Voters could change their party status up until Monday. Your comment that I got something in the mail because I might have been a future Hillary voter is salacious. There is no way the SOS would have known who I was voting for. Your fishing expedition to try to lay a case for why Bernie is (probably) going to lose CA, is a fail. and sent me materials that were not marked in any way shape or form by any promotion for a candidate, and only sent me and other prospective Hillary voters, the instructions. That is your theory. I live here and I get them. There is no difficulty. You can also skip all nine of those steps, and register as a Democrat, which is a lot easier to keep track of. I think it has more to do with Sanders than socialism. Sanders' has stated that his approach is to bring back the New Deal coalition (white working class.) That coalition broke up with itself over civil rights though, I think this election will be the final break up with the left's old love affair with bringing that back as a path to victory. Any socialist looking for gains is going to have to reach deeply into the population that approves of it more highly and find out together what we can build in the future.